The Haskel gas booster line offers both hydraulic-driven and pneumatic-driven gas booster units. The hydraulic driven gas boosters are ultrahigh pressure compressors that can withstand pressures to 16,000 psi. For easy seal replacement, they also feature a floating piston. 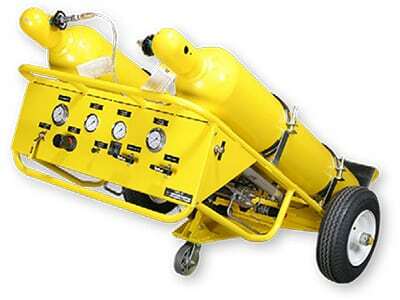 The pneumatic-driven gas booster is available in a single acting, single stage configuration. They are the smallest and lightest Haskel gas booster with pressure capabilities up to 39,000 psi. These gas boosters provide an economical means of boosting pressure for testing of small components and similar applications where volume is small and efficiency is not as important.